I (Colby Sharp) love the Nerdy Book Club for many reasons. One of the biggest reasons is that Nerdy Book Club members don’t look at the summer as a time to separate ourselves from our jobs. We look to the summer as a time to grow. Do we relax? Sure. We sit by the pool…and read. We go on road trips…with books. We spend time with friends and family…and end up adding to our list of books to read. What we don’t do is go back to school in the fall as the same teacher who left school at the start of summer. We do things like participate in Donalyn Miller’s Book-A-Day Challenge. We participate in Twitter chats like #engchat and #titletalk. Some of us are lucky enough to attend conferences like American Library Association or All Write. Nerdy Book Club members are always: growing, learning, collaborating, and, of course, reading. After chatting with a few Nerdy friends, we decided to throw a literacy version of Ed Camp. Not familiar with the Ed Camp model? Check out the video below. We are not really sure if this crazy little idea is going to work, but after seeing Nerds from eight states register in the first week, we feel like we might have something special on our hands. I know that any time I get together with my Nerdy Book Club friends, I learn all kinds of great things. 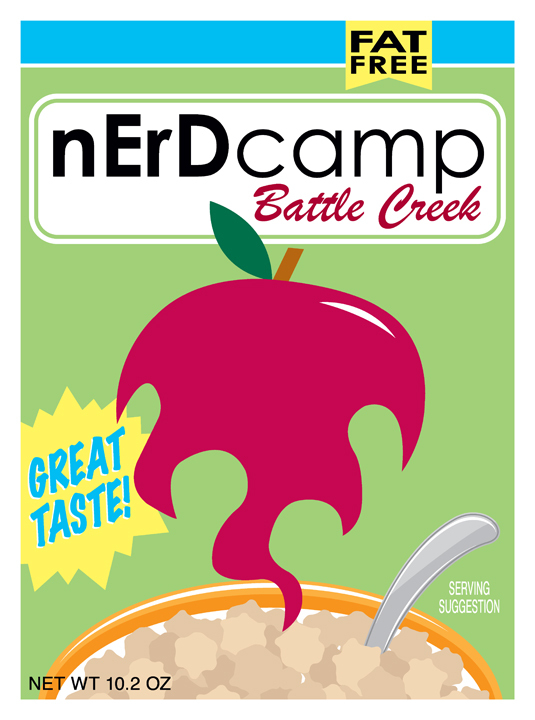 Click here to check out the nErDcamp registration page. The nErDcamp team came up with 10 great reasons as to why you should consider coming to nErDcamp Battle Creek. Please leave a comment and let us know how you plan to develop your inner Nerdiness this summer. For more information visit the nErDcamp website. Niki Barnes is a 2nd grade teacher in Michigan. Her secret inner book nerd was released when she was introduced to Twitter by Donalyn Miller. She is a proud (library) card carrying member of the Nerdy Book Club. She feels very blessed to share ideas and her love of books with so many amazing authors, teachers and librarians. You can find her on Twitter @daydreamreader or writing about books on her blog www.daydreamreader.com. Brian Wyzlic is a 7th and 8th grade teacher in Michigan. He has a secret love for author bios, so he’s going to get out of the way so others may have room to tell of themselves. Follow him on Twitter at @brianwyzlic if you’d like. He doesn’t [usually] bite. Suzanne is a fourth grade teacher in Michigan. She has been teaching a while now, but is a first-year Nerdy member (and so happy to be part of this team). She has loved seeing how a classroom library transforms kids’ concepts of reading, how technology can bring authors and readers together, and how kids who are readers and writers feel about themselves as learners and as people. Alaina Sharp teaches high school chemistry, probably has ADD, and reads just for fun. She’d really love to share this enthusiasm with her students and is actively searching for creative ways to do this as a science teacher. You can find her (if you dare) at @sharpsgalore or westernchemistry.blogspot.com or sharpchemlove.blogspot.com or…no that’s it. Jen Vincent is a Teacher Leader supporting new teachers through the Teacher Mentor Program in the suburbs of Chicago. She caught the Edcamp fever after organizing Edcamp Chicago in April and is honored to be working with this amazingly nerdy team to bring nErDcamp to Battle Creek this summer. She is on Twitter as @mentortexts and blogs at www.teachmentortexts.com. I am so excited to be part of this event! Super excited for ALA, ISTE, nErDcampBC, #bookaday, #summerthrowdown, and … All the amazing times I’ll get to connect with my tribe this summer for rejuvenation, new ideas, & of course, new books for my TBR pile! Thanks Sherry! I can’t wait to see you and learn together this summer! We are going to have a blast! I wanna go! We have family plans that week but I’ll be following along vicariously on twitter. This sounds like a great idea! Please follow along on Twitter! 🙂 Thank you! So glad to hear this! I’m seriously bummed I can’t go this year. This is why I signed up to attend! Thought the top 10 reasons would include: Niki, Colby, Alaina, Suzanne, Brian, Jen, etc!. I will be there in spirit! Thanks Allison! I thought Donalyn should be one of the reasons too….along with all the amazing educators, librarians and authors!! It is going to be awesome! I’ll follow on twitter, sounds terrific-am going to see Peter Johnston right here in Denver, & going to All-Write! So excited! I would love to come! Trying to work my schedule out and recruit a colleague or two to come with me!! I hope it works out! Would love to learn with you at Nerd Camp. Any online connection for those who can’t make it physically to the Camp? We will be tweeting and we are also working on video as well. I’m having no luck recruiting a traveling companion or roommate, but I am doing everything I can to get to nErDcamp in Battle Creek, MI. It’s all my family is hearing about, so I think they are getting the hint.